The company Sport-Tiedje looks back on more than 30 years of company history. Since the beginning of the 80s, we have notched up a strong expansion that has made us Europe's leading specialist for home fitness until today. 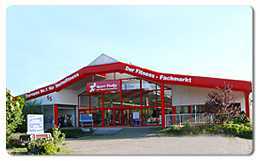 Europe's leading home fitness specialist with more than 700 employees developed from a small sports shop in Schleswig's town centre. 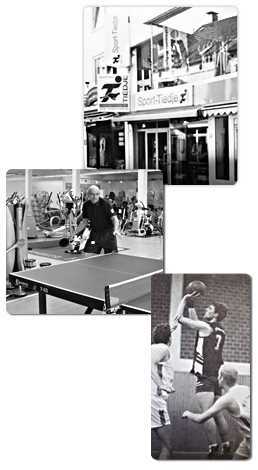 Ulrich Tiedje, former table tennis league player, lay the foundation for Sport-Tiedje starting the business on April, 1st in 1984 and acquired a dedicated and pioneering business partner when the information scientist and regional league basketball player Christian Grau entered into the business in 1996. Taking up the challenge to discern the signs of the times and to follow the trend, we offered our fitness range on the internet in 1999 first. Ulrich Tiedje and Christian Grau founded the Sport-Tiedje GmbH as equal partners only two years later in order to create the best prerequisites for servicing our customers in the best possible way and to implement our company philosophy in a straightforward way. In March 2011, our eponym Ulrich Tiedje left as partner. Since then, Christian Grau is sole owner of Sport-Tiedje. Our company philosophy is to provide our customers with the best product with the best service and the best price-performance ratio. Thus, we have not only increased our warehouse capacity many times over since 2001 and have turned our head office into a large-scale enterprise. In particular, we have also established our branch network at home and abroad systematically. Trend and requirements of times, just like our dedication and the trust of our customers, have made us what we are today – Europe's leading retailer of home fitness equipment. This position was reinforced by the takeover of OZI Sport B.V., a leading fitness equipment supplier in Belgium and the Netherlands, in April 2015. Under the brand of fitshop, Sport-Tiedje runs sixfurther branches in the Netherlands now as well as fitshop.nl, fitness-rent.nl, and fitness-dump.nl, three strong websites, which strengthen the existing Benelux business distinctively. In November 2015, Sport-Tiedje continued its expansion course in the United Kingdom. With the takeover of Laidir Leisure Ltd. from Glasgow, the second largest home fitness supplier in the UK reinforces the Sport-Tiedje Group. Thus a wide-range online shop as well as 12 stores in the UK belong to Sport-Tiedje under the brand of Powerhouse Fitness. In addition, 21 fitness equipment locations at KARSTADT sports have belonged to the branch network of Sport-Tiedje since November 2016. 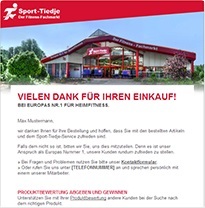 Being shop-in-shop stores in the city centres, Sport-Tiedje offers its customers selected fitness large equipment for testing and purchasing nationwide. 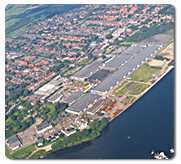 Our head office based in Schleswig has an administration complex with a total area of 3000 sqm. 110 employees coming from 13 nations are available for our customers offering 10 languages. Our staff will advise you in a friendly and competent manner on any questions you may have regarding products, technology or service. Our qualified staff including sports scientists, top athletes, and fitness trainers among others, will be more than happy to attend to you individually, to provide approaches, and to come up with a long-term fitness concept. We have 79 branches with trained staff and own technicians' bases in order to service you better locally. Offering showrooms of more than 25000 m² in our stores, we give you the possibility to test our equipment on site and get complete advice. More than 75 full-time technicians and 45 vans with GPS satellite-supported communication system are in use regionwide for installation of equipment and technical customer service. Further technicians are on hand at our head office and will answer your technical, service and warranty questions when you call our hotline. We guarantee a professional and clear processing of orders and enable the prompt and uncomplicated dispatch worldwide as our warehouse capacity is high. 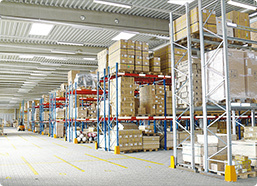 Having a 20000 m² high rack central warehouse in Büdelsdorf, the warehouses in Glasgow (8.500 m²) and Bodegraven (500 m²) as well as 6500 m² warehouse space at our branches and our small-parts warehouse, we achieve a warehouse availability of 98%. The dispatch of more than 300,000 orders in 2016, which generally took place only a few hours after our customers placed the order, reflects the efficiency of our logistics system. Offering more than 7000 products in our 24 daily updated online shops, we offer you a carefully selected, high-quality, and manufacturer-independent range of products for fitness and fitness equipment. We provide you with detailed and clear product illustrations and descriptions and you benefit from a superb price-performance ratio. We also provide after sales service by answering your questions about setting up or operating the equipment. We are at your disposal in a long-term and sustainable manner whenever you have any sports scientific or product specific questions. Our monthly Fitness-Newsletter will inform you about special offers, fitness trends, fitness tips, and new products on request. Our customers' satisfaction is our utmost priority. Our current customer base of more than 2.700.000 customers speaks volumes.